Agilux Agima – John's Cameras. This well designed 35 mm camera was made in Britain in the mid to late 1950s. I would like to say that it is an example of superb British design but it is, in fact, a close copy of a German Paxette camera from Carl Braun in Nurnberg. The camera has a coupled rangefinder which was a rather upmarket option for the time – the Paxette II only offered an uncoupled rangefinder. I am not able to find any reference to this camera in either Wallace Heaton’s Blue Book or the Photography Almanac for the late 1950s so I have no idea as to price or available options. Sylvain Halgand’s Collection d’Appareils website has technical details of the camera – in French but rather easy to understand. The shutter housing has no name on it and I assume that it was Agilux’s own design. The design is rather innovative. The shutter release is a lever on the top right of the shutter housing. This lever depresses a short way to fire the shutter. It then travels to the base of the housing to advance the film one frame. This allows for very fast shooting – I can manage two frames a second. The other main feature of the shutter housing is that the lens is removable. The mount is based on a two pronged bayonet and must include a linkage for the coupled rangefinder but for the life of me I cannot see how this is achieved. Actually, I have just had a closer look at the lens – part of it came away and it is now clear that the front of the lens is missing and that the focus helical is not held securely in place. There may be other things missing which impinge on the rangefinder mechanism. Sadly, this means that the camera is unusable and I shall not be able to test it with film. This is my second Agilux camera. My first is the Agilux Agifold folding medium format camera that was not well designed. The Agifold camera gave the impression that its was designed by an engineer who had a clear brief but had never actually used a camera. The chap who designed this camera had clearly used a camera – a Paxette! Time for a detailed description. 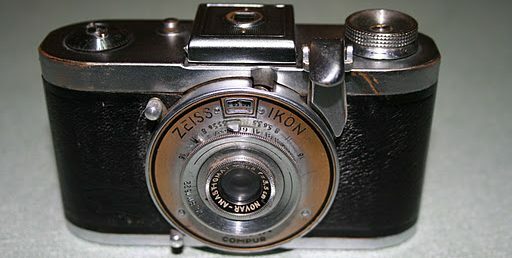 The camera measures 4.5 inches by 3 inches by 2.5 inches (this is an English camera and no pesky millimetres were used). Its weighs x ounces. The ends of the camera are semicircular (or, to be specific, semi-cylindrical). The top plate is satin finished pressed metal – I think it might be stainless steel. The immediately strange thing is that there is no film advance knob or lever. On the right hand end of the top plate is the frame counter. This counts up from zero to a maximum of 40. Only the multiples of five have a number, the intermediate frames having a line. At least one actual number is visible at any one time and frequently two. This counter is reset to zero by hand – there is a thumbwheel for this purpose just behind the numbers. Dead centre on the top plate is the accessory shoe. This has no electrical contacts and so is a cold shoe. halfway between the accessory shoe and the left hand end is a small hole towards the front. This goes nowhere and is immediately blanked by chromed metal. Just behind this is a small screw. I am thinking that this is some sort of adjustment. I am unable to make it do anything. To the left of this hole is a small window which gives onto a rotating disc with black and white segments. This is very useful. The film cassette fits onto a two-pronged shaft. When this shaft rotates so does the disc in this window, giving a visual indication that the film is moving. This is useful when advancing the film as its confirms that the film is firmly attached to the take-up spool. This disc also rotates in the opposite direction when rewinding the film. Just behind this window is the camera name – Agima – stamped in the metal. On the heart of the top plate on the left is what looks for all the world like a film advance lever. It is, in fact, a film rewind lever. I have cameras with a rewind knob and cameras with a rewind crank but this is the first time I have seen a rewind lever. The advantage is that it is not at all fiddly. It has two drawbacks for me. It has to be used left-handed and for most of us that is awkward. It also needs to be used 38 times for a 36 exposure film which is both slower and more tiresome than either a knob or a crank. Just behind the accessory shoe is the viewfinder eyepiece.This is reasonably large and bright. It also does duty as the rangefinder eyepiece.I can make no comment on the rangefinder as there is clearly visible in the viewfinder the half-silvered mirror for the rangefinder in two separate and loose pieces. There are bright lines in the viewfinder. A large set which almost fills the viewfinder is for the standard, 45 mm, lens. The other, smaller, set are for use with the optional long focus lens. On the far right of the rear of the top plate is a small hole. This gives onto a small screw and I am sure that this is for adjusting the rangefinder. The front of the top plate has a raised bezel. This is black plastic and should be covered by a metal fascia which is missing on my camera. This bezel has three windows. On the left (while looking at the front of the camera) is the small circular rangefinder window. On the right is the large square viewfinder window. Between them is a matt grey window. This has the function of providing the light for the bright lines in the viewfinder. The front of the camera is, as always, dominated by the lens/shutter.These are of Agilux’s own make – at least there are no marks to indicate otherwise. The lens has no model name but is marked as an anastigmat with a focal length of 45 mm and a maximum aperture of f/2.8. The glass has a blue tint indicating that it is coated. As mentioned above, the front element is missing together with its fitting. This has the knock-on effect that a the rest of the glass (at least two elements) and their fixing is now loose enough to come off. It also means that the camera is unusable. The lens is designed to be replaceable. There is a small, unobtrusive, lever on the left side of the shutter housing. Pulling this up as far as it will go releases the lens. The lens is held inplace by an idiosyncratic bayonety fitting with only two tabs. The lens housing includes the iris diaphragm which has eight blades and offers apertures from f/2.8 to f/16. The focus helical offers distances from 3 feet to infinity. Once the lens is removed, the shutter blades are exposed. There are only two of them – they are blued steel – and they move with a scissor action. Shutter speeds range from one second to 1/350 seconds. The last is only half a stop faster than the slower 1/250 seconds and probably represents the limits of Agilux’s design. On the top of the shutter housing is a flag. When the shutter has been fired the flag is white and when the film has been advanced the flag is red. On the top left of the shutter housing is a cable release socket. This is not standard and will not accept a standard cable release. The standard is a conical/spiral thread but this socket has a helical thread. I presume that Agilux could have provided a suitable cable release. On the top right of the shutter housing is the shutter release/film advance lever. Pressing this down about 1/4 inch fires the shutter. Pressing this lever all the way down advances the film one frame. This is quite a nice feature which is both easy and fast to use. The big drawback of this is that there is a long, wide slit down one side of the shutter housing – 1/8 inch wide by 1.75 inches long – which means that there is no water or dust resistance at all. Right at the bottom of the shutter housing is a small peg. This is there to allow the camera to stand stably on a flat surface. To gain access to the insides to load film it is necessary to remove the back and base in one piece. To this end, there is a small slider at the bottom of the back. Sliding this to the left releases the back/base. With the back removed the first thing I noticed was that the pressure plate is not fixed to the back but is a hinged plate – the hinges are at the top of the film gate (copied straight from the Paxette!). Lifting this plate up reveals the film gate itself which is pretty much standard. At the base of the film gate is a large sprocket wheel. It is this sprocket wheel which actually moves the film. In most cameras, the sprocket wheel/shaft will only turn in one direction and there is a button which needs to be pressed to free this to allow the film to be rewound. Here, the sprocket wheel can freewheel in either direction which makes rewinding much easier. The take-up spool has two slits in it to take the film leader – there are no tabs or springs to hold the film in place but the system works well. The film cassette sits on the left and engages on a two-pronged shaft at the top. There is nothing to hold the cassette securely until the back/base is replaced. The casting details at the base of the cassette chamber suggests that Agilux had originally considered a hinged bracket as in the Paxette they so clearly copied. Next Demaria-Lapierre Dehel folding camera.